Saint John was born the son of a nobleman during the reign of King Davit Kuropalates. For his love of Christ he left his family and the world to be tonsured a monk. After informing the royal court of his decision, St. John received a blessing from his spiritual father to travel to Greece, where he settled at a monastery on Mt. Olympus. At that time, as a “sign of friendship,” the Byzantine emperor returned the Georgian lands he had conquered to King Davit Kuropalates, but as a “sign of dedication,” he demanded that children of the nobility be sent as surety. Among those sent to Byzantium was St. John’s son, Ekvtime. St. John begged the Byzantine emperor to release his son, and when Ekvtime was finally freed, John took him back with him to the Monastery of St. Athanasius the Athonite (the Great Lavra). At that time the famed Georgian military commander Tornike Eristavi came to visit St. John. Tornike was soon tonsured a monk and given the new name John (the saint is commemorated as John-Tornike), and he settled at the Monastery of St. Athanasius the Athonite as well. Soon the Georgian faithful began to flock to the Monastery of St. Athanasius, and John withdrew from the monastery to a more secluded place, where he constructed a cell and a church in honor of St. John the Theologian. Two more churches were later built in that same area in honor of theMost Holy Theotokos and St. John the Baptist. In such a way the celebrated Iveron Monastery of Mt. Athos was established, with St. John as its first abbot. After the repose of his faithful friend and assistant St. John-Tornike, it became difficult for St. John to continue to labor on the Holy Mountain. He and several of his disciples planned to leave Athos, but in the end they remained at the insistence of the Byzantine emperor. St. Ekvtime robed the holy relics of his fleshly and spiritual father in costly linens and later erected a church in honor of the Archangels over his grave. Once, at dusk, the monks of the monastery beheld a pillar of light shining forth upon the sea. The vision lasted for several days, and finally monks from every monastery on the Holy Mountain gathered and descended together to the sea. They beheld an icon of the Mother of God shining brilliantly and floating upright upon the surface of the water. The fathers lowered a boat onto the water, hoping to bring the icon back with them to the shore, but each time their boat approached the icon, it drifted farther out to sea. St. Gabriel reposed peacefully on Mt. Athos. 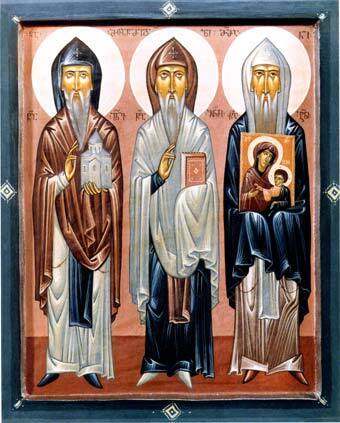 © 2006 St. Herman of Alaska Brotherhood.